I love music, though I really don't play any instruments. Of course I can identify most instruments...flute, clarinet, piccolo, oboe, trombone, trumpet, etc. My granddaughter, Sarah, plays the piano and guitar and she played the bass in her school orchestra. 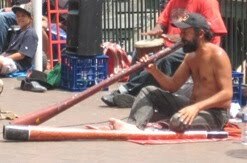 When The Don and I were in Australia last December, I took this picture of a man playing the Didgeridoo at Circular Quay in Sydney Harbor. Since we'd never heard (or heard of) a Didgeridoo, that was a new experience. While the Didgeridoo is an odd sound, it's not unpleasant. Even Crystal Bowersox sang the Beatles 'Come Together' accompanied by a Didgeridoo when she was competing on American Idol. The Didgeridoo originated on the northern coastline of central Australia. The characteristic feature is that the Didgeridoo, which is a slightly flaring wooden tube about 1.5 metres in length, is simply hollowed out by natural termites ("white ants") from the trunk of one of the small trees of the region. After the tree is cut down, the instrument is cleaned out with a stick, the outside is scraped and painted, and the blowing end smoothed by adding a rim of beeswax. Now along comes the Vuvuzela! I'm usually working at my computer in my home office while The Don is in the next room watching some hunting show, NASCAR race, or other sporting event. I couldn't figure out what on earth he was watching that included a constant, very annoying buzzing noise. As it turned out, fans were playing the Vevuzela (pronounced voo-voo-zella) at the the World Cup soccer games. 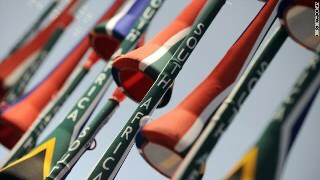 The Vuvuzela is a horn South Africans play for 90 minutes at every football (soccer) game. You can follow this link to a video on YouTube called 'Vuvuzelas Explained' to find out why they're used...and why they're so annoying...even a danger to your hearing. While it's great to learn about other cultures, I can tell you that listening to the Vuvezela for 90 minutes is more than I can tolerate...either live or on television. This is one tradition they can keep in South Africa. Please tell me what you think of the Vuvuzela.